Financial services is a risk-averse industry by nature. Compliance and regulatory standards initially acted as barriers to full-scale social media adoption. Times, though, they are a-changing as social relationship platforms like Hootsuite and LinkedIn provide safe, compliant methods to address these challenges. In this first installment of a three-part interview series, LinkedIn’s former Director of Financial Services, Dan Swift, shared some of his insight into the financial services industry’s increasingly positive relationship with social media. Read on to get his thoughts on what financial institutions are doing, and should be doing, to stay competitive in the social ecosystem. Hootsuite: There is a perception that financial institutions have been slower to adopt social media. Where do you think the industry is today in its adoption of LinkedIn and social media in general? Dan Swift: Compared to sectors like technology, for example, it has been slower, yes. This is partly due to the risk-averse nature of FSI. The issues and challenges around compliance add a lot of complexity in this heavily regulated sector of the market. But,within the last two years, I’ve seen a fundamental change in mindset around social media in the industry. Conversations are no longer completely focused on compliance because the technology ecosystem has evolved, and advances in education and training have helped ease the fear. Employees feel protected now, and leaders are saying that social media is a massive opportunity if we get it right. FSI is asking: How can we embrace LinkedIn? How do we get started with the program? What value does it provide to our customers? 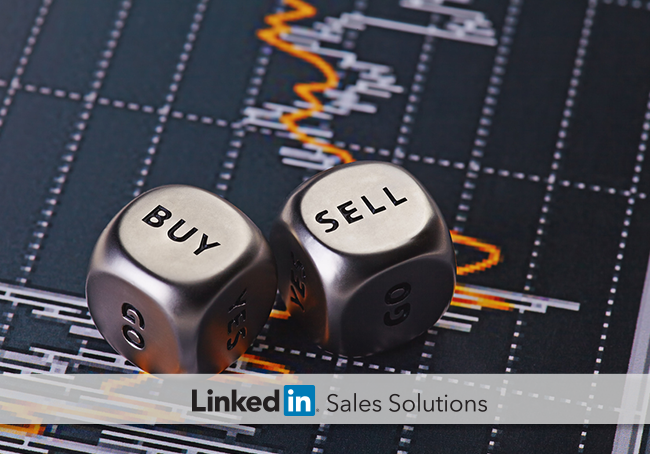 Candidly, this is why LinkedIn launched the Sales Navigator program. It combines an educational curriculum to get employees in financial services using LinkedIn effectively. HS: Are there specific sectors in FSI moving more quickly to adopt social media? DS: LinkedIn has a Social Selling Index (SSI) to measure the social savviness/social engagement of different industries. It helps us understand our users, and prioritize what we offer so we can target it to the appropriate audience. The data from the SSI shows a surprising forerunner: the industry around wealth management, which is interesting as it’s one of the most highly regulated sectors. This area has solved a lot of its compliance challenges, and recognizes the enormous potential of social media. We learned from a recent survey that 70% of high net-worth individuals use social media —C-level executives, business partners, and business owners—. The wealth management industry wants to connect with these people, and LinkedIn and its communities provide the means to do so. HS: Are there opportunities that the wealth management sector is leaving on the table? DS: You might be familiar with the term “cascade of wealth” as it relates to the aging population. As wealth moves down to the younger generation, many of whom are on LinkedIn, there is tremendous opportunity for the wealth management sector to ensure their advisors have positioned themselves with family members on LinkedIn and ultimately to leverage those relationships to ensure the younger generation feels comfortable with the family advisor. Financial advisors that are not active on LinkedIn risk losing the assets of their clients in the future to advisors whom their children feel more comfortable with and who are socially savvy. In addition, those who are creating meaningful, information-rich profiles, and sharing useful content are building up their reputation. This is new for the industry so anyone getting involved now is seeing huge success. Being discovered by new entrepreneurs in hotspots like New York and Silicon Valley is also a great opportunity for financial advisers. These younger people haven’t necessarily worked with a financial advisor before, and are looking for a professional that understands them and their needs. If you have a strong social presence that shows who you are and what you stand for, you will be found—the data shows this to be true. Decision-makers in the high-tech market naturally gravitate to social media; this group is among the most active LinkedIn users. The wealth management industry is already in perfect alignment, so it’s just a matter of understanding what will connect them with their target audience. with that audience and start taking action. To the point above, if there is more specifics to share about how Wealth Management industry can 'start taking action' we should use that as a transition to Series #2 - otherwise we can begin with Insurance/Banking next. Every single advisor should have a complete profile on LinkedIn and be connecting with family, friends, clients, prospective clients (after a meeting) etc. Connecting with people on LinkedIn should become part of the daily routine of every advisor. The LinkedIn Sales Navigator program provides onboarding to LinkedIn, initial training on how to write a business profile, how to build a network and how to use Sales Navigator to find, relate and engage with high net-worth individuals through referrals on LinkedIn. It even allows advisors to save individuals as leads, even if there is no current referrals opportunity. As soon as someone in the advisor’s network connects with that individual, the advisor is notified allowing the advisor to ask for a referral. For the advisors that nest in a company, Sales Navigator surfaces other likely high net-worth individuals that an advisor could approach through his or her existing connections in the company while keeping the advisor updated with insights on what is happening at the company that might impact his or her clients. We launched the LinkedIn Sales Navigator program to help our members find the best financial advisors and for advisors to connect in a thoughtful way through leveraging insights and relationships. And it works. One large wealth management firm in the US recently won more than $100m of new investible assets in the first 12 weeks of using the program.